Oxford Treatment Center is hosting a free community event on the topic of underage drinking and its effects on teens and young adults. “The Culture of Alcohol: Current Perspectives on Underage Drinking” is set for Tuesday, April 23, from 6 to 7:30 p.m. at the Oxford High School Library. The event will feature two testimonials followed by a Q&A session with panelists including Jay Hughes, Mississippi House of Representatives and candidate for lieutenant governor; Meg Hayden, nurse at Oxford High School; Dr. Stephen Pannel, medical director at Oxford Treatment Center; Kevin Frye, attorney and candidate for Mississippi State Senate; and Mark Stovall, CAT, CMHT, Chief Operating Officer at Oxford Treatment Center. 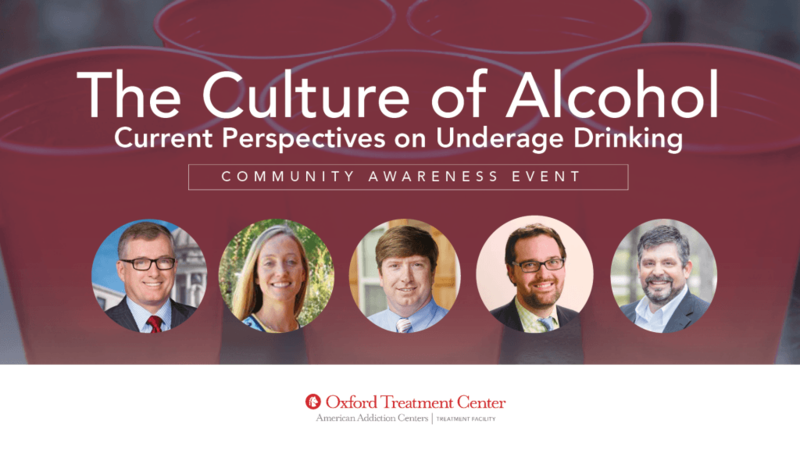 These speakers will address how alcohol is shaping the lives of young people ages 12-25 within the Oxford community, said Brian Whisenant, director of community relations at Oxford Treatment Center. Brian Whisenant, Director of Community Relations at Oxford Treatment Center, hopes this event sparks a conversation about underage drinking within the Oxford community. “Our goal for this event is to help people see issues surrounding alcohol through a new lens,” Whisenant said. The program will specifically look at raising awareness about underage drinking and reinforcing efforts to prevent and reduce alcohol use or misuse among adolescents. It was created in support of SAMHSA’s Community’s Talk initiative for town-hall meetings nationwide. An American Addiction Centers facility, Oxford Treatment Center provides a complete continuum of care for drug and alcohol addiction at two campuses in Lafayette County. While the opioid crisis has gripped the nation’s attention in recent years, many patients at Oxford Treatment Center still cite alcohol as their reason for getting help. “Compared to illicit drugs, alcohol is a different beast because it’s legal for people over age 21,” Whisenant said. “When it comes to addiction, almost every person who uses drugs used alcohol for the first time in their teens. In a small university town, Whisenant said, the issue of drinking among those in middle school and high school is closely tied to the observed behavior of college students.